Section 501 of the Migration Act 1958 (Cth) (the Act), which empowers the responsible Minister to cancel a visa or refuse a visa application on various character grounds, has attracted significant attention of late. Recent decisions of the Federal Court have imposed various limits on the discretion, appearing to shift away from broader interpretations of the provision which previously dominated judicial thinking. 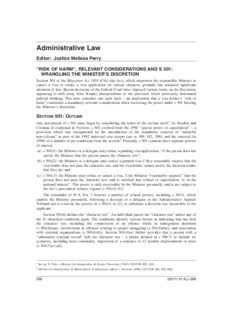 This note considers one such limit – an implication that a visa holder’s "risk of harm" constitutes a mandatory relevant consideration when exercising the power under s 501 limiting the Minister’s discretion.